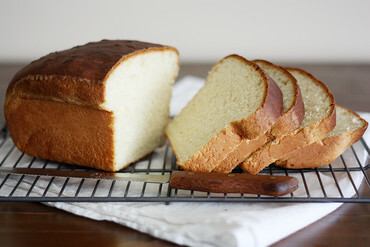 An easy, no knead bread, perfect for sandwiches or toast. This recipe is featured at Girl Versus Dough. Dissolve yeast in water. Let stand 3 to 5 minutes. Pour milk into a bowl with butter, sugar and salt; blend. Stir yeast-mixture and pour into bowl. Add eggs and about ½ the flour. Beat 2 minutes with electric mixer on medium speed, or by hand until smooth. STOP MIXER. Add in the rest of the flour mixture, a little at a time and beat again until smooth. Scrape down batter from sides of bowl. Cover. Let rise in warm place until doubled, about 50 minutes. Grease a 5x9x3-inch loaf pan (or a 9-inch tube pan or a 10- inch mold). Beat down raised batter in about 25 strokes. Pour into pan, it will fill pan ½ full. Let rise only until edges of batter reaches top of pan, about 30 minutes. If an extra dark crust is desired, sprinkle 1 TBSP sugar over the batter just before it goes into the oven. Bake 30 to 40 minutes in preheated 400°F oven. Remove from pan. Place on rack to cool a few minutes before serving.